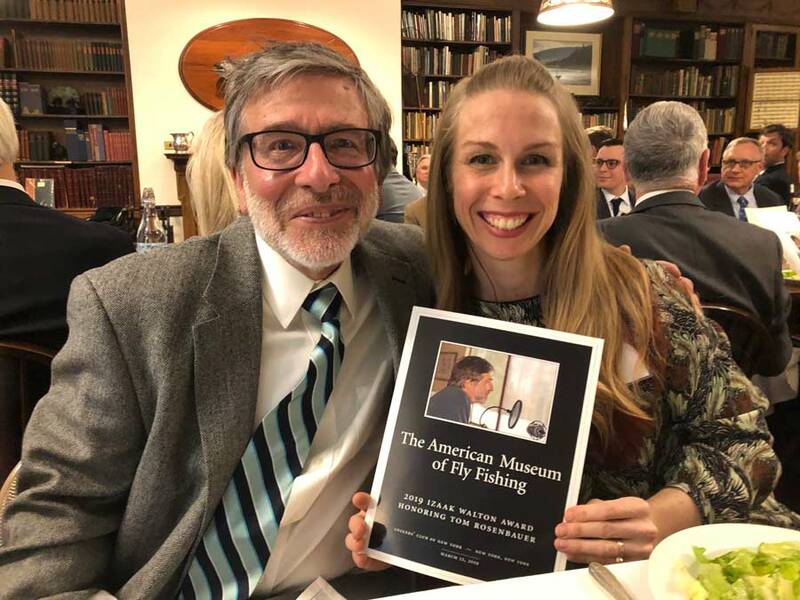 Tom Rosenbauer and his daughter, Brooke, at the New York Anglers’ Club. 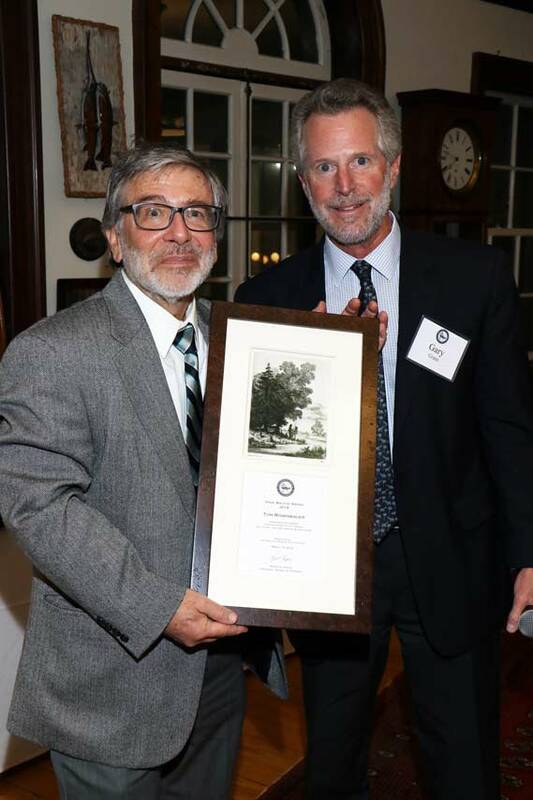 Tom receives the award from Gary Grant. Schullery goes on to praise Tom’s work in educating anglers, his strong voice for conservation, his deep passion for fly tying, and his innovative contributions to the sport itself. “In short,” Schullery concludes, ” [Tom] has had an extraordinarily important life-long career with the sport, its development, and its good causes.” We couldn’t agree more. I’m lucky enough to sit next to Tom every day, and I can attest to the veracity of all that Schullery writes. But it’s also important to note that Tom’s remarkable stature in fly fishing is not accompanied by egotism, self-importance, a sense of entitlement, or ill-humor. He is consistently gracious and generous–giving of his time and expertise whenever called upon–and he’s also just a hell of a lot of fun to be around. Tom poses with last year’s award recipient, Rachel Finn. 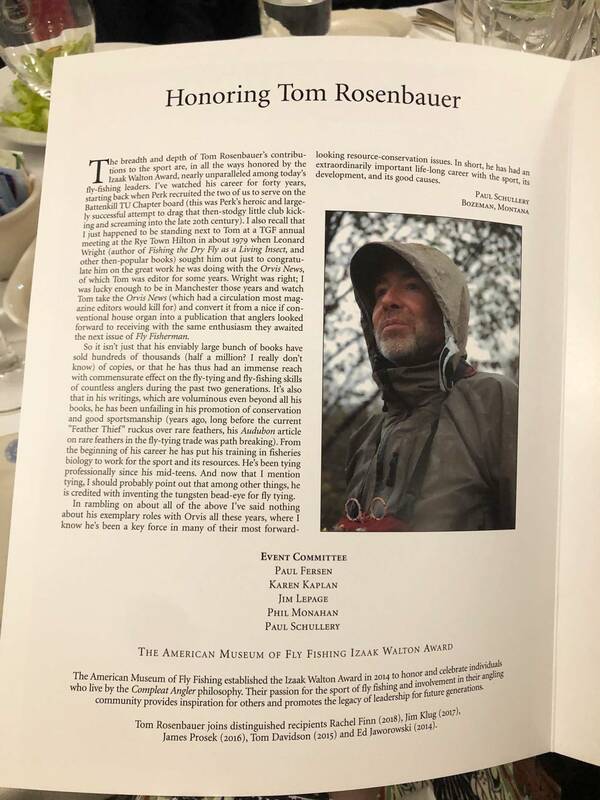 So please join everyone at Orvis and all his friends around the country and the world in congratulating Tom for an honor well-deserved. 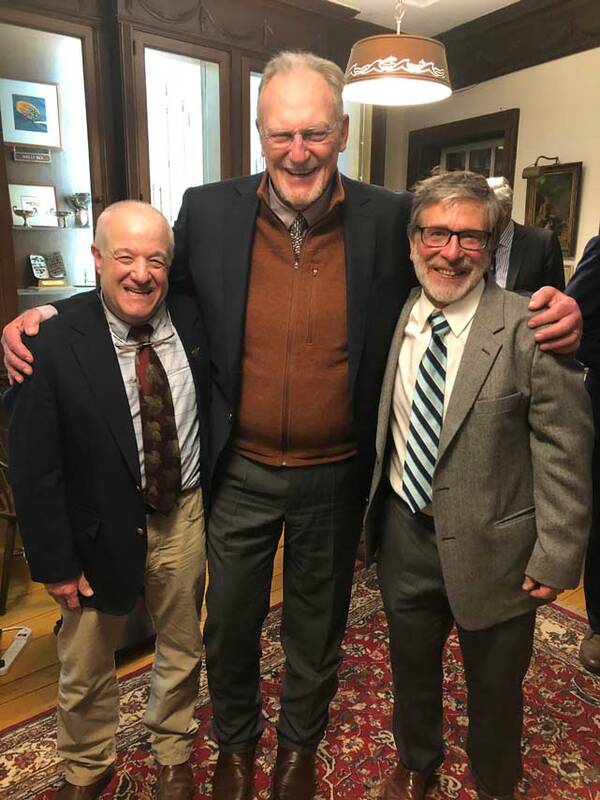 Tom with long-time Orvis associates, Jim Lepage (l) and Paul Fersen (c). Paul Schullery’s remarks on Tom’s award. Click here for a larger version. 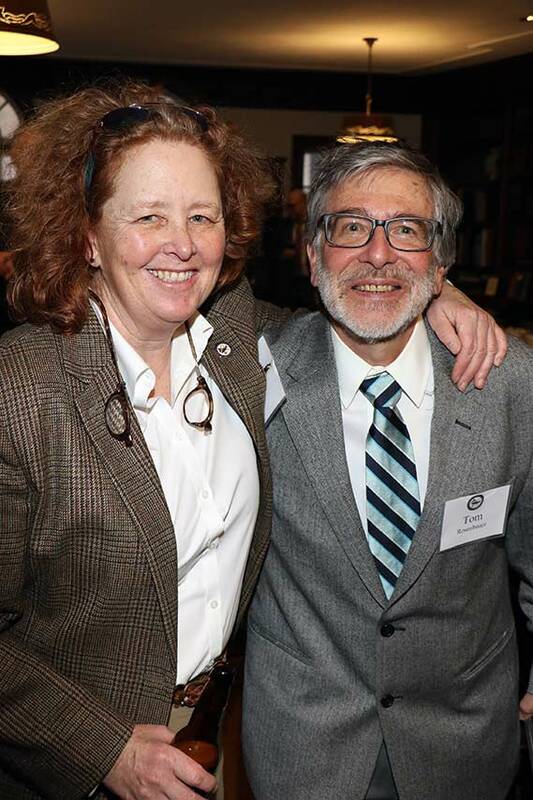 I had the pleasure of meeting you at an Orvis grand opening, and I thoroughly enjoyed the evening. I listen to just about every podcast (and contribute to same), have many of your books, with one signed from that grand opening evening. I am the fly fisherman I am today because of you. Congratulations on an award well-deserved. I’m currently on my fourth replay of the entire podcast series and look forward to each new episode. My wife Carolyn and I would like to extend our sincere congratulations to you on this most memorable lifetime achievement award. You are a most deserving recipient and should be very proud. Again, sincere congratulations. Tom, congratulations on the Izaak Walton award. Through your books, videos, and podcasts you have taught me how to fly fish, tie flies, and truly appreciate this great sport and lifestyle. Best wishes. Howdy Tom, Congratulations on winning the prestigious Izaak Walton Award. Certainly a well-deserved honor. C’mon upta Maine sometime & try your luck landing an arctic charr. Regards, Michael Leavitt, Saco, Me. C O N G R A T S T O M ! I notice that Orvis is having it’s annual Giant Fly sale. Perhaps in his next podcast, Tom could discuss the conditions in which these Giant Flies would be the most effective. All my flies are pretty small. My only regret is that I don’t know Tom personally, even though he has taken the time on two separate occasions to respond to an email or podcast question. He has fished in British Columbia on the Skeena River, which only proves that he’s a genuine fellow. Warmest congratulations Tom for your life long success and all that you’ve brought to our sport to help give us some of that success as well. You certainly look different in a suit. Is it made of Gortex? I have never seen so many photos of Tom in a coat and tie before. Come to think if it, I’ve never seen him in a coat and tie at all before. Did he rent them?